On 8th February we say NO to City Council budget cuts! Bristol is one of the two cities in England that they have a mayor. Mr. Ferguson, architect and founding director of The Academy of Urbanism, was elected 15 months ago has decided to transform Bristol to the paradigm of ‘entrepreneurial city’, to the paradigm of city-enterprise. He has been planning this transformation focused on the interests and the profits of the few, of the entrepreneurs without accounting for the future of the workers, especially the workers of the City Council, and the quality of life in specific neighbourhoods of Bristol, especially the poor and degraded ones. This is the plan of Mr. Ferguson, the mayor of our city, ‘our’ mayor. Mr. Ferguson has been extremely consistent to his ideas. His promises in the pre-election period have started to be realised in the last 12 months. Initially, the liberal mayor has promised tens million pounds cuts of housing, transport and local care services. Afterwards, he decided to apply the anti-social Bedroom Tax in the area of Bristol ‘contributing’ to the murderous policies of Con-Dem government. Eventually, in December 2013, he decided to reveal the whole of his plan. He proposed £90m of City Council cuts. This is more than the 25% of the current budget. As a result, 1,000 more people will become unemployed. Many services, such as libraries, kindergartens, care services, public toilets and public parks, that Bristol residents relied on will be greatly affected. We demand that the City Council (is meeting on 18th February and we will be there!) opposes the cuts! This is not an accidental decision. It is positioned in the broader policies that have been applied in the last five years by the urban, regional and national States under the European Union directives in order to confront the consequences of the current global crisis. These policies have been focusing on murderous austerity and budget cuts and have led to deeper economic recession, increase of unemployment and degradation of workers’ living standards. Rich have become less and richer while poor are more and poorer. These divergent trends are the only way of confronting the crisis in favour of the rich businessmen and against the workers. Since December 2013, major reactions and protests took place in the city of Bristol against Ferguson’s decisions. The outcome has been the emergence of the campaign ‘Save Our City’ which is supported by, among others, Bristol Trades Union Council, GMB, Unison, Unite, NUT. The next important date is 8th of February and the demonstration at 13.00 at Castle Park. Real Democracy Bristol supports and participates in this demo and, in overall, in this struggle until we cancel Ferguson’s plans! We will not take the cuts lying down! We demand that our elected mayor withdraw these proposals to cut £90m from local services and sack 1,000 workers. Instead he should defend Bristol and demand back money taken from our city by the Con-Dem government. We call all the people of Bristol to join the demo on Saturday, 8th February, 13.00, Castle Park, and reject these policies! We oppose City Council budget Cuts! In the last four months the University Staff is taking industrial action after a democratic decision of the University College Union. 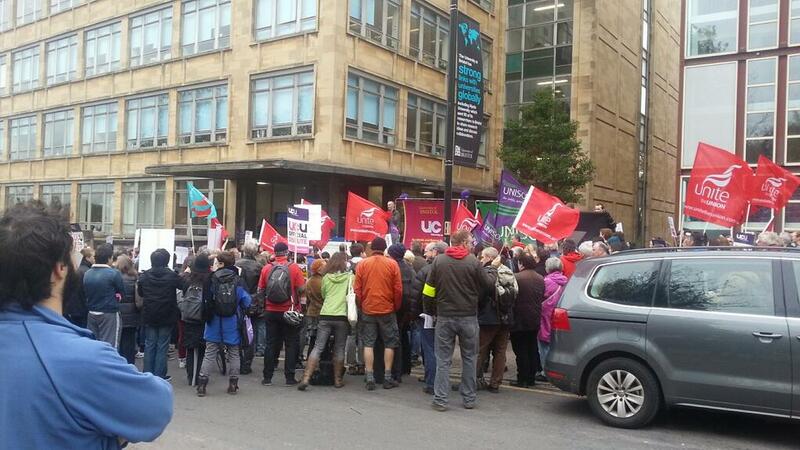 30th October was the beginning with a big joint strike of UCU, Unite and Unison in all the universities of the UK. This struggle went on and on 3rd December when UCU hold a national 24 hours strike. In 2014 two 2 hours strike on 23rd and 28th January were the initial key actions. The next one is the 24 hour national joint strike of UCU, Unite and Unison. 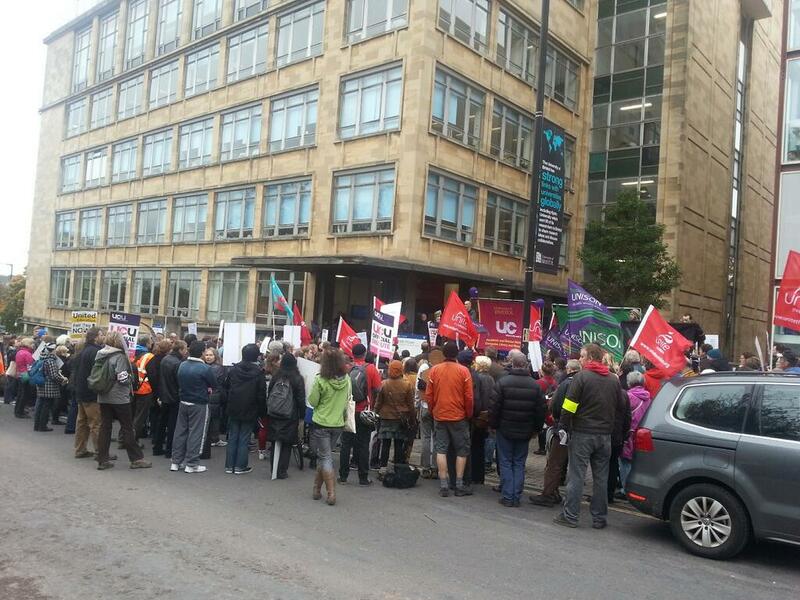 The University Staff decided to take industrial action since they have been offered a pay rise of 1%. This highlights the incentives of the employers if we account for the inflation that is around 3%. Since 2008 this policy has led to a 13% pay cut in real terms. It needs to be noticed that the surplus in higher education is around £1bn. This pay rise (1%) will be applied until, at least, 2016 as the British Government has decided. We decisively support this struggle! The workers in the university struggle for a better salary, for better working conditions in the context of the current crisis that leaves social ruins in its development. Rich are getting richer and poor are getting poorer! Professors, researchers, technicians, administrative staff and cleaners struggle for a better university! We support and we express our solidarity to them! This struggle is a struggle of the whole society! All the workers, unemployed and youth need to stand united and defend the education and health system, their life! We call every youth, student, unemployed and worker to join the struggle of University Staff, and specifically on Thursday 6th February the picket lines outside of the most of the university buildings (from 8.00 am) and the joint rally that will take place in University of Bristol outside the Senate House at 10.30 am. Victory to the struggle of the University Staff! We will not pay for their crisis! BRISTOL Tuesday 5/11 @ Fountains, 5:00 p.m.
NO MORE AUSTERITY AND CUTS! WE WILL NOT PAY THE CRISIS THAT THEY CREATED! Workers, unemployed, students and pensioners are being victims of the measures based in austerity and budget cuts all over Europe. This is the consequence of the neoliberal policies that the states and institutions (like the European Union or IMF) are applying in order to confront the current crisis, to restore the profit rate, to service the total debt and to bailout the banks. THESE MEASURES DO NOT SAVE PEOPLE’S FUTURE! THEY WORK FOR CAPITAL’S SURVIVAL FROM ITS CRISIS! Due to these unfair policies the poverty is increasing every day, as well as the gap between rich and poor. The consequences of austerity policies have been evident mostly in the periphery of the European Union, where unemployment, precariousness, massive immigration, huge loss of benefits in health and education, the increasing number of homeless people and suicides, as well as the emergence of fascist phenomena endanger people lives. Apart from the peripheral states, austerity is also a reality in the U.K. The neoliberal attack in the post workers, as well as the deterioration of the health and care system and the significant cuts in education seem to be only the beginning. WE HAVE PRODUCED THEIR WEALTH, BUT NOT THEIR CRISIS!! We stand by the struggle of fire-fighters, university staff, teachers, post workers and all the fighting parts of society! We should take action and struggle as reaction to the huge waves of austerity and budget cuts, defending our social and economic rights and achieve social justice. WE WILL NOT PAY FOR YOUR CRISIS! FOR OUR NEEDS! FOR OUR FUTURE! We are sorry to announce that the Assembly of Real Democracy Bristol on Friday 1st November is cancelled. We will keep you updated for the next assembly of our group.